Support for a variety of weir calculations is achieved by adding the discharge calculations of weir-type flowmeters to the M series' basic expressions. 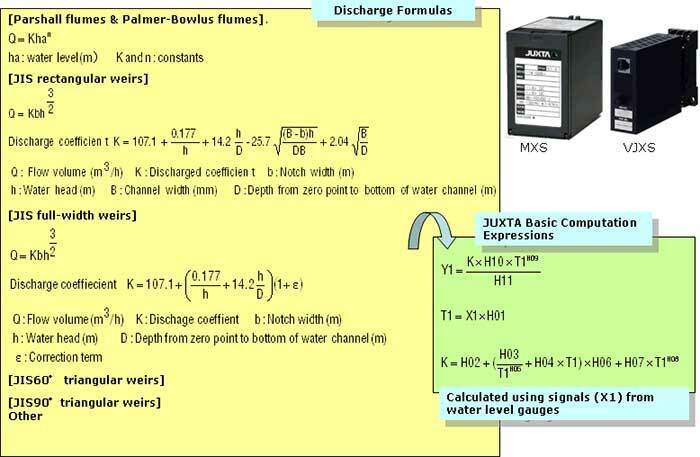 Because the water head and flow volume obtained in the calculation process are stored in the buffer registers, they can be confirmed using JHT200 handy terminal or VJ77 parameter setting tool. These operations must be programmed by the user when using the free programmable model. The MXS and VJXS do not include a power supply for transmitters. If you need to use a power supply for transmitters, please use a distributor. M Series computing units include a type that supports user-specified programs, and types that support analog memory, peak/bottom holders, moving averages, dead times, temperature/pressure compensation, and a wide range of other applications.